While Burnley can be relatively relaxed about their Premier League future, Sean Dyche admits that had no bearing on James Tarkowski’s new contract. The 25-year-old centre back had 18 months left on his current deal, but, with speculation linking him with Arsenal and Chelsea, the former Brentford man has agreed to extend his stay to the summer of 2022. 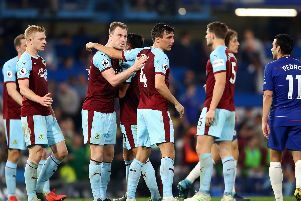 Dyche explains that was on the cards regardless of Burnley sitting in seventh place with 34 points at the start of January. He said: “Yep. We’d have still done it. (At the same level?) Yeah. “Our financial stability is good. That’s the good side of the planning. “The hard side is when you want to get that next big player in, and you think ‘I think we can get that one’, and find out the reality of often their contracts, not just the fee, that’s hard to take sometimes. “There have been a number of situations we were in to, and we’ve found out the reality of the numbers and couldn’t do it. While Burnley were not forced to sell Michael Keane and Andre Gray in the summer, as they entered the last year of their contracts, they didn’t want to have Tarkowski in the same situation. But it isn’t always that simple to avoid players’ deals running down: “We’ve always kept open lines of communication with players and agents, we can’t afford not to. “We’re not a club who can get to a level of payment that is so high that they say I’ll definitely stay regardless. “Our openness is important with the players. There comes a time when the level of what we can get to is just not appropriate for any given player, and they’ll think as much as they’ve enjoyed it there comes a time when reality bites. “Andre was a clear example of that. “Then it’s the realm of the player, it’s hard for them. The theory of being careful because it’s a short career has changed because of the amount of finance now but the PFA average is still only around seven years, so you’ve got to be mindful of that. “If a club comes along and pays a large amount of money and then the large contracts that comes with that then it’s a difficult one for us as a club. There’s a reality of where we are, we’re building and getting stronger financially, but we’re not near some clubs. Tarkowski has slotted in seamlessly after the sale of Keane to Everton, with speculation he could be called up by England for the March friendlies - as well as Poland, for whom he also qualifies to play. Dyche accepts he has grown for his experience in the Premier League: “I think a lot of it is game knowledge and experience, the details of playing against some of the top players in Europe, possibly the world, as much as any coaching formats. “You get to an age and a performance level where the games becomes an increased teacher. The higher up you go the more it’s about your knowledge of actually being out there and doing it. “We can support that with analysis, information and advice, but a lot of it from subliminal learning where you’re doing it all the time. “Your brain sharpens, you see pictures quicker. I call it smelling danger, a good centre half can smell the danger early and the best centre halves have games where you don’t notice them much. “Tarky is on his way with that, Ben Mee does it very well I think, he doesn’t always get the same plaudits as Tarky and Keano have had because he’s so efficient so early in the process. I think Kevin Long has come a long with that, he sees things better and sees things quicker. And on his England hopes? : “Gareth has been at Burnley a lot more often over the last year-and-a-half or so, which is a good sign. Gareth will make his own mind up. “Not every manager fancies all the same players. It’s a funny one when you’re England manager I imagine because you get a lot of outside noise over who should be in, but really it’s still like a club where there's something in players where you think it will fit with what you want.